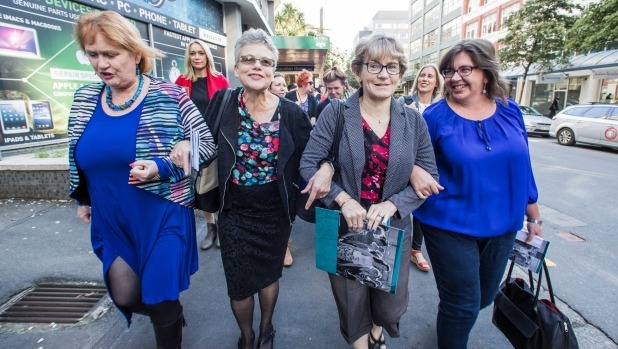 A 10-year fight for pay equity for those who dedicate their time to helping children with learning difficulties has reached historic mediation with the Ministry of Education, with talks getting under way in Wellington. Three education support workers, Kathy Power, Mary Jones and Denise Tetzlaff, are using pay equity mediation set up by the Government to push for fairer wages. Their fight follows that of Kristine Bartlett, an aged care worker from Lower Hutt, who argued in court that her employer was underpaying staff because of the high percentage of female employees. This resulted in the Government introducing legislation late last year that meant employees could file pay equity claims directly with their employer, rather than through the courts. On Monday morning the women gathered at the NZEI Union headquarters in Wellington, and spoke of thier roles and how challenging they could be. The teachers’ union is a party in the mediation hearing. It was a huge responsibility, and could be tiring, especially when sometime staff were hit or bitten, Power said. The starting hourly rate for a support worker was just over $16, but for someone who had done it “thousands of years” like Power, it reached $19. The low wages meant it was hard to keep skilled support workers in the in the job, Jones said. “Because we’re not valued well enough, people move on,” she said. Mother Sarah Martin took the opportunity to lend her support to the cause, and say thanks on behalf of parents for the work support workers do. Her 6-year-old son has dyspraxia. The support Martin and her family has received, as well as her son, had made the journey easier. The mediation that started on Monday is expected to take two days, but it’s not clear when an outcome will be known. Previous Post:The Bachelor NZ recap: What now, Intruders? Next Post:Monday Got You Down? Let SNL’s Bobby Moynihan Treat You to the Best Birthday Party Ever!